Mikaylah Gillespie, Alexis Day and Savannah Phillips led the attack as the Rattlers became Belleview High School's 3rd ever program to make the Final 4 and bacame Regional Champions in a convincing 25-23, 25-22, 25-20 victory over Fivay HS. Up next, A tuesday showdown with Tampa Robinson for a chance at a state title on Wednesday. RATTLERS FINISH 2nd IN STATE!! OH WHAT A YEAR! The Rattlers claimed the 2013 District title and First ever Regional Championship and then reached historical milestones with a Final Four victory, coming up just short in the State Championship game. 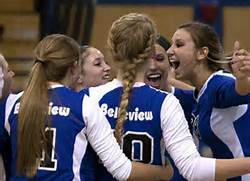 Congrats to all the great young ladies and coaches for taking Belleview on a great ride!! #2 Trust in your Teammates "Learn their strengths"
#3 Bring Backpack,Water bottle and towel to every game. #4 Talk when on the floor and on the bench "No pouting"
#7 Keep Moving, become an Athlete "Hustle takes no talent"
#10 Remember our saying" The Legs Feed the Mind"
Spike Just aint a hairdo! !